When the NY Jets moved up to grab Franchise QB-designee Mark Sanchez with the fifth overall selection of the 2009 NFL Draft on Saturday, and the realization set in that there would be no tumultuous quarterback transition in Washington this offseason (or at least this weekend), I experienced a moment of vague disappointment. In fairness, it was probably due as much to the sense of “losing out” to another team—the competitive juices flow hard on draft day—as it was legitimate concern over the long-term best interests of the Washington Redskins (talking QB changes everything). Nonetheless, in that instant I felt a little deflated. As the subsequent picks unfolded and the Redskins selection drew closer, with big men like OT Michael Oher and DE's Brian Orakpo, Robert Ayers and Aaron Maybin still on the board, I got jazzed all over again. And when Denver surprisingly chose RB Knowshon Moreno at number twelve, leaving the Redskins a virtual smorgasbord of highly-rated big men from which to choose, I quietly pumped a fist. It only took a moment for the mental image of Orakpo putting his hand in the dirt alongside Cornelius Griffin, Albert Haynesworth and Andre Carter to dance into my head. It took only a few seconds more to envision him standing over Phillip Daniels, Renaldo Wynn or Chris Wilson’s shoulder on that first 2nd-and-long of the new season, or sliding up and down the line on 3rd-and-long behind Haynesworth, as NY Giants QB Eli Manning tracks him warily. It sank in fast ... the Redskins may well have built themselves pass rush Saturday. Been talking a lot lately about how the Redskins haven’t had a pure pass-rusher since Charles Mann (no disrespect to Andre Carter) left town in 1993. They have had good defenses in that time, yes, particularly since defensive coordinator Gregg Williams brought his act to town in 2004 and Greg Blache continued it in 2008. But one thing they have not been known for since the end of the first Gibbs era has been pass rush. The additions of Haynesworth and Orakpo remake the Redskins defensive profile almost overnight, and potentially at least, point to an evolution away from the strictly containment-type units they have fielded for years and toward the kind of aggressive, ball-hawking defenses in cities like Pittsburgh and Baltimore that Redskins fans have eyed jealously for so long. There are no guarantees, of course, that any of this will happen. Orakpo could become 2009's version of Mike Mamula as easily he could its Dwight Freeney. But as of today, with seemingly unlimited potential stretching for the next ten years in front of him, and what his development could mean for his team, it is difficult to look at his selection with anything other than excitment and anticipation. We will see the Redskins new prize bull take the field in a Redskins uniform for the first time in the Redskins preseason opener against the Baltimore Ravens on August 13. For those scoring at home, that’s 108 days. Brian Orakpo becomes the first defensive lineman the Redskins have drafted in the first round since they made DE Kennard Lang the 17th overall choice in 1997. 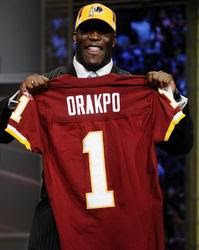 In the 72 college drafts since the franchise moved to Washington in 1937, Brian Orakpo becomes the Redskins' eighth defensive lineman chosen with their first available pick. He becomes only the fourth defensive lineman selected in the first round. He becomes the second-highest overall defensive line selection in team history, behind only DT Joe Rutgens, chosen third overall in 1961. I will give my take on the rest of the Redskins draft in the days ahead ... but for today, it’s all about the big man. Regardless of his selection slot, regardless of how close the team did or did not come to opting for Sanchez and a titanic quarterback controversy instead, the fact remains that Brian Orakpo—physical specimen, consensus man-beast and potentially the strongest pass-rushing burgundy and gold presence Dexter Manley—is a Washington Redskin. As someone old to remember what that looks like on game days, count me as pretty damn juiced. By the way, one quick request to young Mr. Orakpo. About that “big bed” you plan to buy, so you can relax and take it all in? Invest in an alarm as well. Maybe give new teammate Fred Davis a buzz—I hear he’s done some research. I'm very excited about this pick, as well. And, even though I know these players have PR guys coaching them on how the handle the media, I think he has a good attitude, and seems to know at least a little history about the franchise. Regardless of what happens with him, I think the pick is a smart move. Hard to see it as anything else. The needs at OT and DE were equally pressing; we can assume the Redskins had Orakpo graded higher than Oher or any other OT left on the board. And frankly, I like their chances of landing serviceable OT help in post-June 1 FA than I do picking up an impact pass-rusher. One way I judge how I "should" feel about pick is to image what my reaction would have been had another team gotten him. And frankly, the idea of this kid playing for the Eagles, Giants or Cowboys is one I'm glad I don't have to entertain. Pass rush = sacks = field position = less pressure on the offense. We became better the second they called his name. How about a new post?? ?